Many years ago, I had the wonderful opportunity to tour Egypt. One of the stops in the Valley of the Kings was a perfume factory that manufactures essential oils. I smelled a number of scents that day but the one that immediately became my favorite was frankincense. I loved its spicy, musky scent and purchased a sizable bottle of the stuff to bring back home. My favorite use of it is on Christmas Eve. After worship, I offer those who attend the service the chance to be anointed with it. Very few say no. There is something magical about the scent that’s irresistible! I’m also glad to report that of the thousands of people who have been anointed with it over the years, not a single one had an allergic reaction to it that I’m aware of. Frankincense to offer have I; incense owns a Deity nigh. Prayer and praising, gladly raising, worshipping God, Most High. Frankincense is also called olibanum and the English name of this resin comes from the Old French “franc encens,” which simply means “high quality incense.” Among Wiccans, it’s planetary correspondence is Sun and it’s elemental correspondence is Fire. Magical properties include protection, exorcism, spirituality, cleansing, consecration and purification. It is believed that when frankincense is burned it releases powerful vibrations which not only lift up those in the area, but also drive out all evil and negativity. It is also burned to induce visions and to aid meditation. According to Scott Cunningham it is easily substituted with copal or pine resin. (I’m allergic to pine so this is not an option for me!) Frankincense is a little hard to grind into a powder with a mortal and pestle but be patient and you’ll get the hang of it! The oil is useful in promoting spirituality and meditative states. When I am doing any magical work that requires an extra boost, I use the following incense blend which is an adaptation of a formula from Scott Cunningham’s indispensable volume “The Complete Book of Incense, Oils & Brews.” This Ares Blend works like rocket fuel for me! I grind these ingredients with a mortal and pestle as best as I can and place them on a self-lighting incense charcoal briquette. 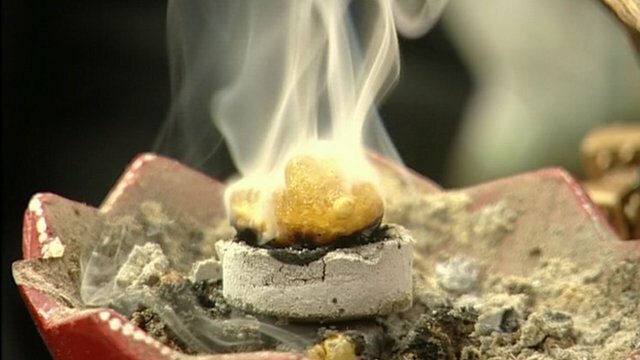 When working with Frankincense it should be noted that it often emits a bitter aroma the longer it burns. For this reason, some prefer to use Copal in its place which stays sweet from start to finish. Copal is also native to North America so it’s the perfect choice for those who live on this continent and feel strongly about using plants and resins that are native to their region. As a final note, Witchipedia says that “recent studies have indicated that frankincense tree populations are declining, partly due to over-exploitation. Heavily tapped trees produce seeds that germinate at only 16% while seeds of trees that had not been tapped germinate at more than 80%. In addition, burning, grazing, and attacks by the longhorn beetle have reduced the tree population. Conversion (clearing) of frankincense woodlands to agriculture is also a major threat.” Because of this, take the time to find out where the frankincense you’re purchasing comes from. My local metaphysical bookstore sells frankincense resin which comes from a company that is dedicated to harvesting it sustainably. It might be a little more expensive but it’s worth the extra cost in my book. This entry was posted in Incense and tagged Frankincense, Incense. Bookmark the permalink.